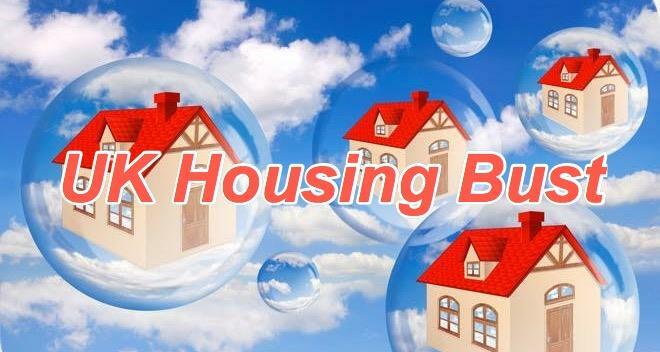 Report Signals UK Housing Bubble Bust: "Home Values Fell For The Fifth Straight Month"
According to the latest numbers from Acadata Ltd., a housing bubble in the UK is steadily deflating due to the economic uncertainties surrounding Brexit, along with tighter monetary conditions via the Bank of England, which could alleviate lingering affordability issues. 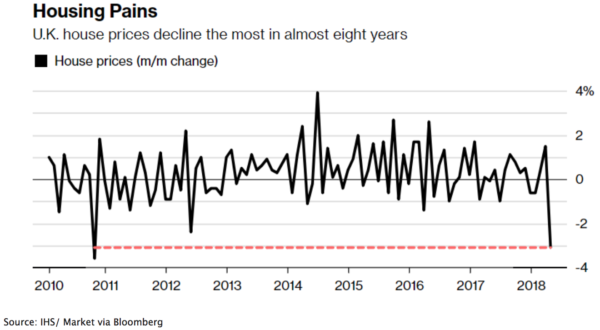 British home values fell for the fifth straight month in July, the longest stretch of declines since the global financial crisis, reported Bloomberg. The ongoing slide in prices, however, has a silver lining to the millennials who have been priced out: homes are becoming more affordable. Home values fell 0.2 percent from June, bringing the average price for a home to 302,251 pounds ($386,000), Bloomberg said quoting a recent Acadata report. London remains a “mixed picture” the report said, with the number of sales in the second quarter plunging by 7 percent from the prior year and prices declining in about two-thirds of the capital’s boroughs. 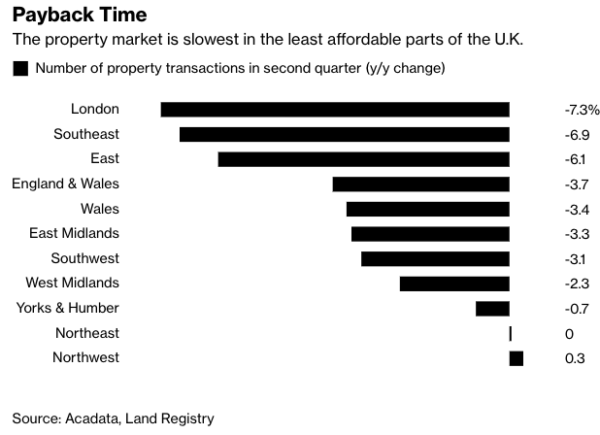 After a three-decade Central Bank credit-induced boom, the British housing market is weakening amid slower economic growth, spurred by uncertainties from Brexit and inflation outpacing wage growth in the last several years. Bloomberg notes London has taken the brunt of the economic storm, where the average home price is more than double the national average. “At the national level, annual price growth has decelerated to 1.6 percent, the least in six years, and sales have declined by 6 percent on a seasonally adjusted basis,” Acadata said. The report also specified that the latest Bank of England’s interest-rate hikes would further reduce housing market activity. Separately, Albert Edwards, an economist from the French investment bank Société Générale, commented on the UK housing bubble, which he told Sputnik — prices could decline by as much as 12 percent as the property bubble deflates. Edwards said the Bank of England’s relentless money printing over the past decade (with base interest rates at a zero lower bound) had driven debt-fuelled demand for housing. “What you are doing is lending them more money, backed by the taxpayer, to push up house prices even more,” Edwards said. As Brexit is likely slated for March 2019, along with more rate hikes from the Central Bank, it seems the days of easy money policies are over which could stave off the debt-fueled demand that had created the housing bubble. Bloomberg also referenced a recent report from Visa and IHS Markit showed that consumer spending slipped 0.9 percent in July from last year. To sum up, the bust cycle of the UK housing bubble is just beginning - suggesting now is the time to sell at the peak, while millennials who have been deprived of an affordable home might have a chance of homeownership in the future once the bust cycle troughs.